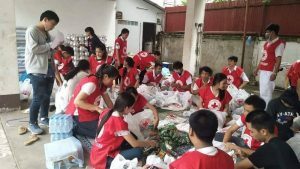 Phoungern-Lao Red Cross Volunteer has been helping to prepare relief items for affected people in Attapeu after the dam collapse. A medical student inspired by his earlier year of serving as Red Cross volunteer came back to help during one of Laos’ worst flooding. 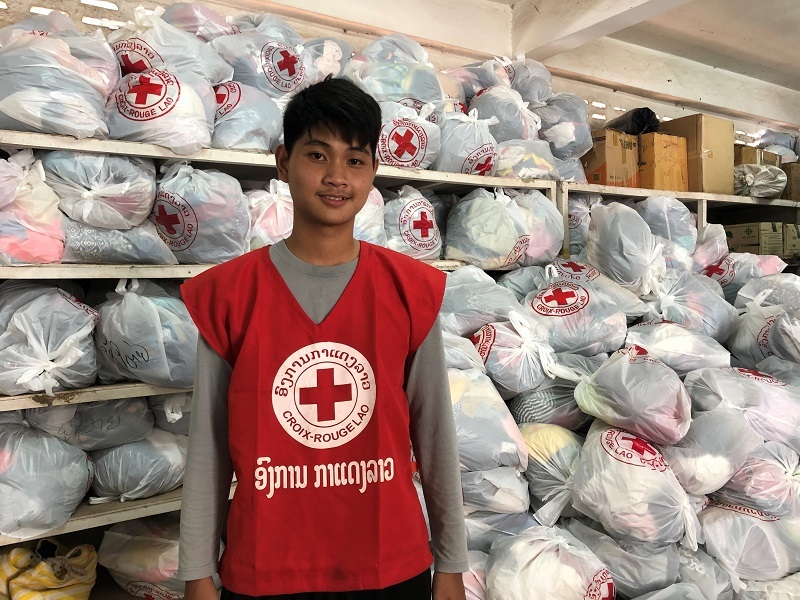 “Nam Hon, Nam Hon means ‘hot water, hot water’ in Lao,” said Phoungern when he tried to start a conversation while loading packets of drinking water onto a pick-up truck at the Lao Red Cross (LRC) Headquarter. The truck would later head to Attapeu Province where people affected by the collapse of Xe-Pian Xe-Namnoy hydropower dams awaited assistance. It had been almost ten days since the flash flooding took place as a result of a dam burst that inundated eight villages of the Sanamxay District, affecting many thousands of people and leaving at least 7,500 people homeless. 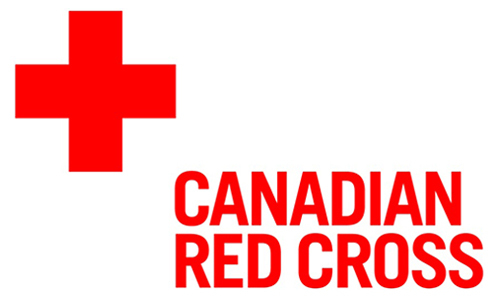 More than 200 LRC volunteers have approached LRC to offer their help. 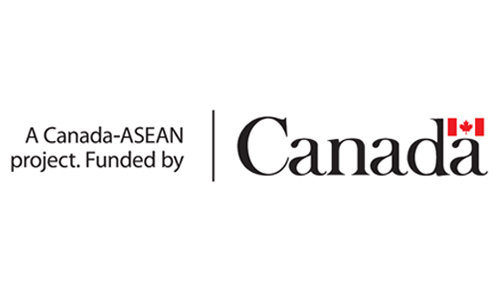 As of today, 2 August, almost two thousand relief bags, consisting of clothes, canned food, and hygiene items, have been put together by these volunteers, and shipped to affected people in Sanamxay. Phoungern is one among the 200 volunteers who has spent at least two dozens of hours screening, packing, and sending their “love and heartfelt support” to those in Sanamxay. When asked about his motivation to volunteer, Phoungern said that it has been a dream come true for him ever since he became LRC volunteer in 2017 and took part in conducting the Youth in School Safety (YSS) activities in his high school on the outskirts of Vientiane. Since then, he has devoted at least a month’s worth of his time supporting LRC in YSS and in preparing relief items, the same way that he has been doing for the last few days.